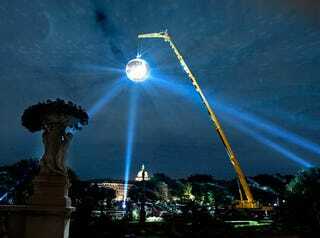 Finally, the City of Light lives up to its name, thanks to artist Michel de Broin's 7.5-meter disco ball suspended 50-meters above the Jardin du Luxembourg. It's even more impressive in action and up close. It took artist Michel de Broin 1,000 mirrors to construct the disco ball for his Nuit Blanche project, and spotlights positioned throughout the city to make it sparkle. The main purpose of the giant mirror ball—other than having a raging citywide disco throwdown—was to simulate a starry sky normally obscured in urban areas by ambient artificial light. If stars these days look halfway as festive as this, I'm getting the heck out of NYC, pronto.